South Park is often known for its irreverent humor. The newest episode, and the last new one of the decade, has the boys going to a water park. over the top state when the urine levels hit 100% causing a flood of pee to go everywhere. As you can imagine, there are a lot of pee jokes. Kyle has to swim through the pee and even gets talked into drinking it (to equalize the pressure so he doesn’t get the bends like in “The Abyss”). It’s a one note joke and it’s disgusting, but you’ll find yourself laughing, sometimes. The problem with this episode is that it has two go to jokes and just repeats them. Every five minutes or so, the government officials will urinate on a monkey to see what the result with humans would be, and to see if their solutions are effective. thing, but I think this is pushing it. It just becomes uncomfortable after a while. I mean, do we really need to see Randy get peed on? The bits where Stan and crew explain the kids lack of hygeine and what not are funny just because they’re so nonchalant about it and Kyle is rightfully disgusted. a bit out of place. I know he’s a racist, but this seemed forced. Though Kyle’s explanation that they were the minority since the majority of people were minorities was amusing. Overall this was a lackluster end to the season. The jokes weren’t bad, but they beat them into the ground and didn’t come up with enough material to fill the 20 minutes. This episode of South Park is clever in repeating the jokes but using satire and irony to keep them interesting. The use of repetition in the episode "Pee" emphasises the over complication with the way a lot of American residents think of Immigrants. The jokes fit together to create an image of hypocrisy and humour, in particularly when the immigrants helped the boys from drowning in pee at the water park. South Park has a short history of using childish humour and jokes to express important political situations in the world. Though it may seem idiotic to some, the short history of politics in South Park tell a long story of how the world works. South Park particularly digs at American living and the hypocrisy that lies in American thinking towards other culture. 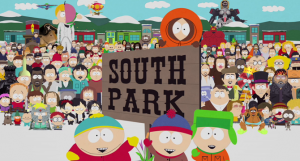 In the episode "Pee" the boys go to the water park where Cartman then goes on to notice a lot of Mexican immigrants. Though his initial thought of the Mexicans is negative, later on Cartman is confronted with the Mexicans when he is in danger of drowning in Pee. The Mexicans offer to help him. The use of using pee in a serious piece of satire can drag in a younger audience, and if intelligent enough to understand, can bring a child to understanding that Cartman is wrong in thinking that Mexican immigrants are bad. By repeating the same joke, it can give more of an understanding to a serious issue and is even capable of shedding light on it if you open minded enough. Well, yes. I started watching them as a teenager and really liked them though, swearing wasn’t ever my thing. After a while, their originality just went away.